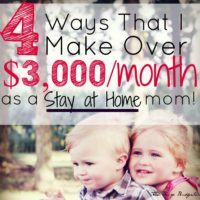 If you’re looking for ways to make money as a stay at home mom, I’ve got a few great ideas for you. Here’s the good news: there are a BUNCH of great options, so you're sure to find something that suits YOU! You see, I was there—a new mom, feeling like I didn’t have a clue how I was going to take care of an infant and a husband, PLUS manage my house AND figure out a way to help bring in some money. Before I had my first baby, I worked a regular 9-5. It was reliable and fine. It paid the bills. Then my son was born. After we did the math, we realized that (holy cow!) it would've cost almost as much to put him in daycare and leave him all day as I'd be able to make at work. We were wondering like, what's the point?? That said, the math also showed us that we wouldn’t exactly be sitting pretty on one income. Um, in fact, we wouldn’t be able to pay our mortgage or our bills, let alone save any money. 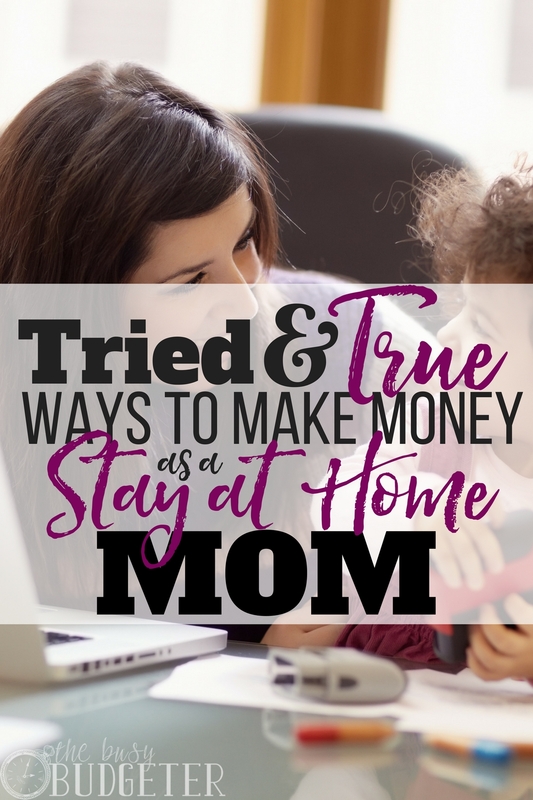 So, once we decided to “take the stay at home plunge,” I had to figure out some creative ways to make money as a stay at home mom. Still, I was pretty confident I could figure it out. I knew I had some skills and I was thinking maybe I could take on a few daycare jobs from home. I wasn’t very tech savvy, but I wanted to give blogging a shot…and I had a few other ideas to try as well. So here's my list of some of my tried & tested ways to make money as a stay at home mom! “Offline” jobs (like childcare) give you a “safe” option for working from home. If you don’t feel like you’re computer savvy or if you really enjoy caring for kids, cooking, running errands for people, or even dog walking, there are a number of great jobs you can do from home. You might look into multilevel-marketing sales opportunities, although, I’ve found many over-promise and under-deliver, especially for busy moms who might not have time to sell, sell, sell. If you have a specific talent like photography, music, gymnastics or art, you could also consider teaching lessons from your home. Advertise at local schools or check out your community center, senior center or church to see if they offer a job board where you can post your skills. You could even run an ad on Craigslist or your neighborhood group on Facebook. When I started out, I took on a few kids in addition to watching my son during the day. I read the great book called Start & Run Your Own Home Daycare, which helped me organize and start my business. I figured since I was already home with one baby, what were a few more?! Plus, it was very rewarding, and I enjoyed providing a service to my fellow moms who were looking for someone reliable to care for their little ones when they were away. If you're crafty or artistic, you could look into starting an Etsy business, selling crafts online. 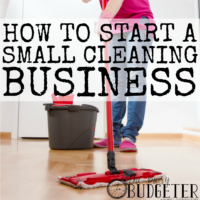 You can also make good money cleaning out your home and posting your stuff for sale online through Craigslist or eBay, or selling it via consignment. Dig through your old videogames, handbags, designer clothing, sports equipment, collectables and knickknacks, and sell them! Here’s the deal, though…selling stuff online isn’t a long-term solution (unless you have unlimited amounts of stuff). When I was first starting out working at home, I tried my hand at selling jeans and brand-name clothing on eBay. I’d go to thrift stores to search through racks and racks looking for brand name items (with a higher resale value) and use my eBay app to post them online. It was quite a bit of work and required quite a few trips to thrift stores and to the post office. To be honest, I didn’t enjoy it. Despite not loving it, I was still bringing in around $700 a month doing it. So, if you’re willing to put in the effort or if you have a good eye and knowledge of antiques or collectables, then it might be worth it for you. Even if you don’t go for eBay, you can still watch for items at garage sales and seek out curbside finds to fix up and sell on Craigslist or at yard sales. So one of the best ways to earn money from home is by working a virtual job (or several)! I started out as a Trend Source mystery shopper and I worked for User Testing—reviewing and testing websites. With those two online jobs (that I could easily do during naptime or in the evenings), I was able to bring in around $200 per month. 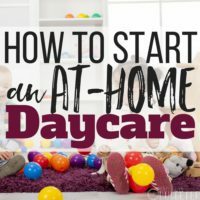 This was a nice supplement to my daycare income, and it was pretty easy. There are quite a few similar small jobs you can do from home. If you have office experience or if you love the idea of helping someone else (and job stability), you may want to consider becoming a virtual assistant. Basically, you take on tasks like emails, making calls, or following up on administrative jobs, but you can work from home and often you can even set your own schedule! If you're great at writing, try being a freelance writer. Other virtual jobs include earning money through sites like Inbox Dollars & Swagbucks by taking surveys and playing games online. I don’t love earning money this way, because I don’t feel like it pays well for the time and effort it that goes in—BUT some people LOVE it and it can be a simple opportunity to earn gift cards and points. When I started trying to find ways to make money as a stay at home mom, blogging wasn’t my top idea for earning money. I started blogging so I could share my experiences with others and connect with like-minded people online. I was having some breakthroughs in terms of budgeting, meal planning and building on my life skills, so I figured sharing with others would be a good outlet and hey, I might even be able to earn some extra money blogging while I'm at it! Today, my blog has grown into a wonderful income for our family—beyond my wildest dreams or hopes. I make over $10,000 per month (well over that, actually) on my blog, and I started earning a decent income pretty quickly when I began. Here’s the deal: I am NOT a tech genius. I didn’t have any experience with blogging, nor did I do some “magic trick” to grow my blog overnight. I signed up for Ruth’s Elite Blog Academy, which was the best foundational resource I could find for learning how to grow your blog to a full-time income. I was able to connect with other bloggers, start affiliate marketing, and find out how to create a Pinterest strategy to connect and share my blog through social media. It wasn’t hard. In fact, compared to my “traditional job”, it was pretty easy. It took some work, but it was also really fun to get started! Not to knock myself, but if I can do it, you can do it too. If you’re looking for ways to make money as a stay at home mom, my recommendation is to try a few different ways to earn money (childcare, teaching lessons, selling on eBay, virtual jobs) while you start a blog. Even if you aren’t sure blogging is right for you, there are so many options and niches you can fill. If you enjoy designing, photography, decorating, cooking, or just being a mom, chances are there’s something you can share with others. It is definitely possible to earn a regular income from home AND earn enough money to make a comfortable living. I’d love to hear other tried & true ways you’ve found to make money as a stay at home mom! I love this post! It is absolutely possible to earn a decent income from home! Thanks for the encouragement and the great ideas. Right now I’m working on my blog, and hope to eventually make a living with it, but I also handpaint Christmas ornaments and sell them on Etsy. I love it, and don’t think I’d give it up even if I didn’t have to do it for money.? These are great suggestions for making money from home. I have an Etsy shop and even though I put very little effort into it, it still makes a decent amount of money each month. If I had more time, I could probably generate even more. Just find what suits you and make it work! The money, no matter how small an amount, can still go towards paying bills or loans so it’s worth it. That’s great! What’s your Etsy shop? I wish i could do a blog myself. So dar my friends and I joint forces and started a blog together. We always traveling so our blog will be about our adventures. Love this post! I’m building my blog too, so your success is truly inspirational! Thanks for this post Rosemarie! You are truly an inspiration to me as I look to grow my blog. Just listened to the interview you did on the side hustle show podcast where you shared some of your blogging and pinterest tips. Love your site! Thank you for this post, Rosemarie! You and Ruth are both inspirations to me, so I have started my own blog! Made In A Pinch is all about streamlining life to make creating homemade food, gifts, DIY, etc more accessible, easier and cheaper for people in an effort to cut back on highly processed foods and mass-produced items. My friend Lisa is doing it with me, and we are so excited to share our passion for creating homemade items with everyone! Heather recently posted…100 Fun and Easy Easter Egg candy alternatives! Thank you for re igniting hope. I was just beginning to feel down about my blog and came here for motivation. I’m so glad! It’s HARD to stay motivated and optimistic in the beginning – don’t give up! Great ideas!! I’m about to put some of them to use!! Need some encouragement!!! If you have musical talent, consider offering your services to a local long-term care facility for a small fee. Residents love when talented people come in to sing for them. 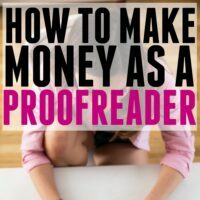 While there are SO many ways to make money online these days, it’s overwhelming and I couldn’t agree more with your Blogging Suggestion. Blogging works exceptionally well when combined with Affiliate Marketing, which is also my Favorite Method apart from Writing. I am always looking for ways to save money. Those are great ideas. There are so many ways to make money online. I really appreciate on this. I will try it from tomorrow hope so i will success. Can you tell me which way do you prefer on yourself? Thanks for the sharing such a helpful artuicle. I am trying to grow my blog. It started last year and am not getting much traffic yet. Any recommendations? Excellent post. You know, I have an online shop and despite the fact that I put almost no exertion into it, regardless it makes a nice measure of cash every month. In the event that I had additional time, I could likely create much more. Simply find what suits you and make it work! The cash, regardless of how little a sum, I will spend them for my mother. I love this post! I have seen so many posts with this same headline that don’t actually give me anything other than scammy looking websites. I’m always wary of scammers when earning money online. Because of my husband’s job (it moves us around every few months), I couldn’t get a “normal” job and have to quit months later. I ended up getting a job with teaching English to kids in China through the company VIPKID. It’s been a great experience. I wrote a couple blog posts about it, and I thought I’d share it here for those interested in teaching from home as a way to make income.